Lots of divorce lawyers wonder whether it makes sense to refer clients to mediation. At Peace Talks, our belief as divorce mediators and custody mediators is that there will always be enough clients who want to fight in court that divorce lawyers never have to worry about changing careers. Those folks don’t want to mediate, aren’t ready to settle, and don’t want to settle. They’re not good candidates for mediation, so don’t worry about keeping up your litigation practice! But what about those clients who want to work out a settlement, but who just don’t know how to go about it? 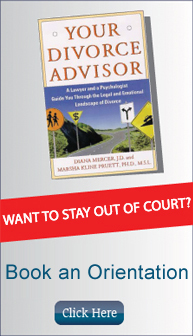 Or clients who don’t have a complicated situation, and who don’t think they need a judge’s help? These might be good cases to refer to mediation, with the divorce attorney acting as individual counsel to one of the parties, either in the mediation room or between sessions. This gives litigation attorneys an opportunity to work with clients in a constructive, counselor-at-law role rather than in litigation mode. Wouldn’t that be a breath of fresh air in your practice? Mediation clients still need plenty of help from attorneys to counsel them individually, explore and reality test settlement options, and to prepare paperwork. At Peace Talks, attorneys are included in the process, not excluded. You’re an integral part of the client’s professional team, and mediations proceed more smoothly when clients are getting the professional advice they need. Your participation helps us as mediators, and so we’re always glad when clients have attorneys helping them through the process. There are also clients with a complicated situation but who are still hoping to work it out. As a litigator, you know how time consuming and frustrating it would be to take these clients through the court system. Maybe the judge will have time to hear and understand the complicated details of their situation and maybe the judge won’t. Why take a chance in court? In mediation, you can counsel and guide your client as his or her individual attorney. You can participate in the mediation session. You and your client will still be using the same sorts of experts and reports as you might in preparation for litigation, but rather than researching arcane evidence rules last minute, you can use that same information in a meaningful settlement conference. At Peace Talks, you’ll have a 3 or 4 hour appointment to use as your settlement conference, rather than the 15 minutes you might get with a judge at a court MSA. That way you’ll be sure you’ve covered all of the details and explored all of the options. Because your client has an opportunity to participate real time, you’re more likely to have a satisfied client at the end of the process. While many clients choose mediation at the outset of their case, mediation can start at any time during (or after) the divorce process. Maybe your client started in litigation but now needs help settling after seeing a custody evaluation report, or after the trial date has been set. Maybe your client has run out of money and now sees the value of settling before running up more fees. Or, maybe the first OSC didn’t turn out the way your client had hoped, and now he or she is willing to consider other options. You can start mediation at any time, and use as many or as few of our services as are needed. It used to be that people thought that mediation didn’t protect clients’ rights. The rumor was that mediators skipped talking about the tough issues in favor of reaching an agreement fast. Not at Peace Talks. We know that the tough discussions are coming, and better that they happen in the privacy of our offices with mediators to help facilitated the discussion rather than in the Starbucks parking lot. Peace Talks Mediation Services, Inc. makes sure that clients make fully informed, thoughtful decisions and that they have the opportunity to consult with an attorney, accountant, or other professionals before making final decisions. Clients can make an unconventional decision in mediation if they want, but at Peace Talks they won’t make an uninformed decision. Click here for a more thorough list of pros and cons of mediation. Clients sometimes think that mediation only works if they already have an agreement or if they’re on friendly terms. We’ve found that there are 2 essential elements to mediation success: clients who want to reach an agreement and who are ready to reach an agreement. We can work on the readiness in mediation a little bit, but clients have to want to reach an agreement to actually reach an agreement. We’re trained to work on the communication and impasse issues. It’s the desire and readiness that are the 2 predictors of successful outcomes. The only scenarios which are really problematic are domestic violence, untreated substance abuse, untreated mental illness, and extreme power imbalances. Our mediation team can balance out most power imbalances and financial control issues if the clients are truly hoping to reach an agreement.